Paris Hilton, Tom Cruise, Will Smith And Other Top Celebrities Join Europa Online Casino In A Brand New Game Top Trumps Celebs. Plus Play Kong And Iron Man 2 New Slots..
Europa Casino, Europe's number one online casino, is pleased to announce the release of four new online slot games this month. The most anticipated is the star-studded affair Top Trumps Celebs, set to be released in March 2011. This glamorous slot machine game has some of Hollywood's top stars (including Tom Cruise, Brad Pitt and Britney Spears) lining the reels as players spin their way to fame and fortune. You can trigger the Red Carpet bonus game or win 10 free spins with extra wild symbol on this 20-payline slot. 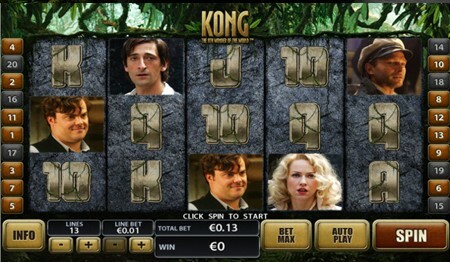 Two of these Europa Casino new games - Kong and Iron Man 2 - are already available to play. The new featuring the iconic ape King Kong of Universal Studios fame, is a larger than life online video slot game with exceptional graphics, lots of bonus games and a unique re-spin feature, all of which keep casino players highly entertained on their way to winning jackpots. Play in Big City or Jungle Mode and find out about smashing bonuses and enormous cash prizes, worthy of this famous giant. This new video slot machine is also an action-packed game with plenty of winning opportunities. Following hot on the heels of Europa Casino’s original Iron Man slot game, Iron Man 2 promises players even more adventures and thrills as they join forces with Iron Man in fighting new enemies Whiplash, the Black Widow and the killer drones. As a Marvel slot game, Iron Man 2 also offers players the chance to win one of four Marvel progressive jackpots each time they play. Join in the fun as Iron Man encounters new enemies and you could benefit from plenty of multipliers and extra bonuses. As for the other upcoming release, Easter Surprise is a charming slot machine game in which players will love collecting bonus gifts from the Easter Bunny himself. All of Europa Casino's online slot machines are powered by Playtech software, for the highest quality online experience, including a fair, safe and secure gaming environment. Europa Casino is Europe’s leading internet gaming destination. A premier, full-service casino, the site offers over 300 online casino games, 19 progressive jackpots, generous weekly promotions and a top-of-the line loyalty program. As a member of the prestigious Euro Partners group, and powered by Playtech technology, Europa Casino is dedicated to maintaining an atmosphere of sophisticated gaming. With attention to detail and quality, Europa Casino maintains full support services for players 24 hours a day, seven days a week in fifteen different languages. New members can take advantage of the $/€ 3,000 welcome bonus. Download free gaming software from Europa Casino website and play the newest games right now.